I'm delighted to put away my winter tights and heels and pull out my sandals - finally. 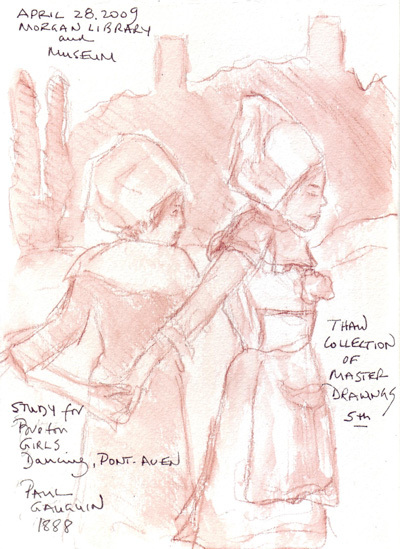 Katherine Tyrrell reviewed Bert Dodson's book the Keys to Drawing, and I thought that it looked the perfect project-oriented art book for me to study this Spring. I have his book Keys to Drawing with Imagination too, but that one has never looked as interesting to me. 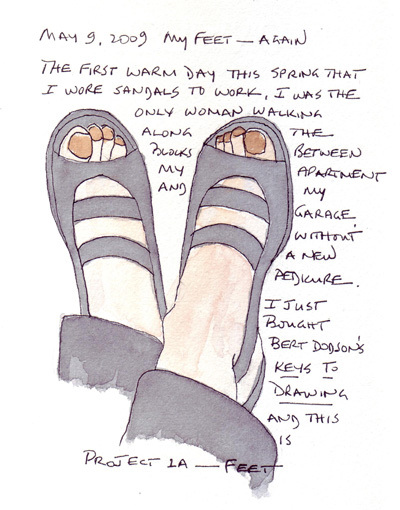 Dodson's Project 1A is to draw your feet, something which I have done several times before. I wasn't supposed to paint them, but couldn't resist. I also wanted to document the nail polish - last week I was the only one walking in my neighborhood, in sandals, without a fresh pedicure. I had a very quiet day at home today, so I did "figure drawing practice" for my daily drawing. 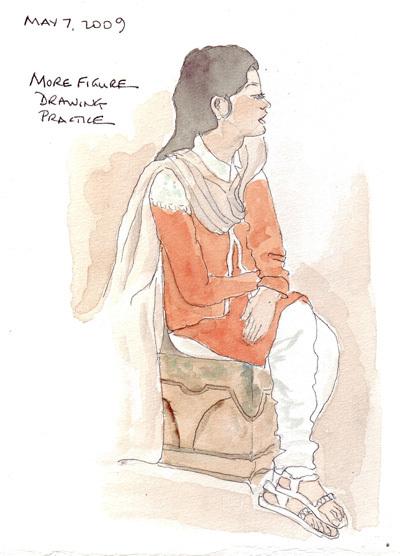 It has been weeks since I painted from one of my friend Bunny's India travel photos, and I was attracted to the quiet pose of this seated woman. I love Niji Waterbrushes! I started playing with watercolor paints approximately 5 years ago and bought a series of round brushes from size 00 to 12. I learned how NOT to spill my water containers, but never felt completely confident that I could paint in my sketchbooks in the living room, bedroom, or friends homes. 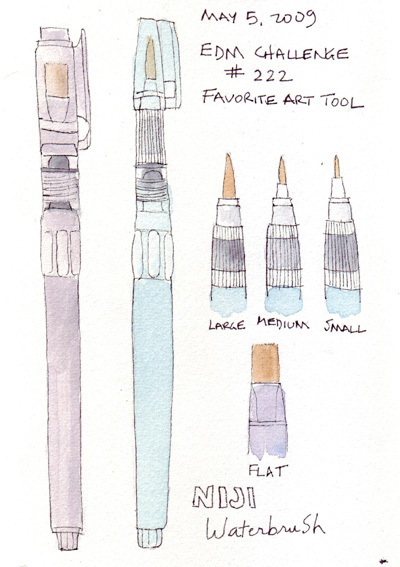 I was an "early" convert to the Niji waterbrushes and now even use them with watercolor pencils in the museum - where only pencils are allowed. This year I found the large flat one which is perfect for painting large areas - and not getting too fussy in small areas. I'm so nervous that I might lose one, that I have a new set of 4 waiting for me with my art supplies at all times! 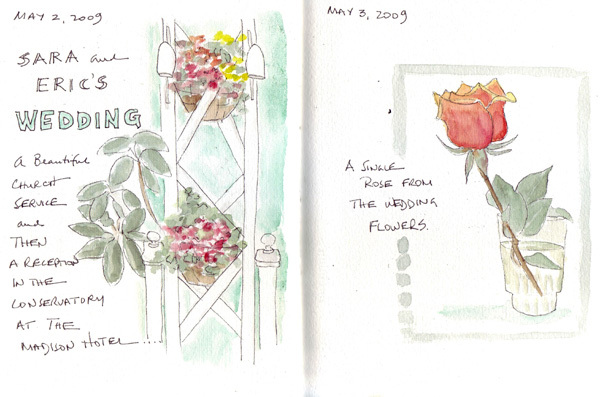 We were at a wedding this weekend, so both of my journal pages are from the event. The wedding was held in a church and the reception in a wonderful hotel conservatory - full of beautiful flowering plants. Just before the cocktail hour I was able to make a quick painting of one of the many floor to ceiling trellises. This morning I painted one of the roses that I brought back to our hotel room last night. The red-orange-salmon color was spectacular. This is a double page spread and the grey line down the middle is the center fold. This is my 3rd year participating in this challenge. I already complete one journal page per day, but I only upload a small number of those pages to my blog. Shouldn't be a surprise that I don't upload drawings and paintings that I don't like. This challenge forces me to upload each and everyone for 31 days - the good, the bad, and the ugly. At the beginning of the month, this makes me a little more careful about choice of subject and may even make me less spontaneous. Midway through the month I can usually overcome these feelings. Here is my journal page from yesterday May 1st. We eat dinner at a restaurant in Grand Central Station before going to the Broadway theater - and almost always have Ceasar salad, a thin crust sausage pizza, and a glass of chianti. 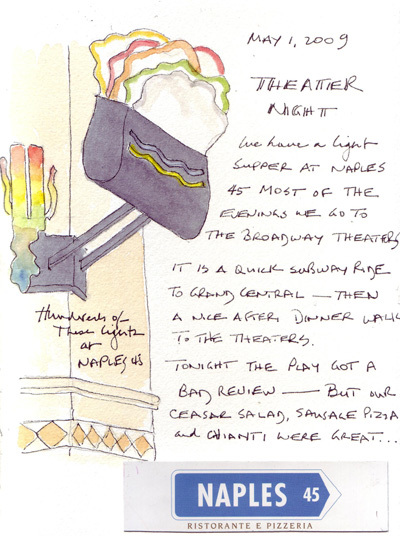 Last night the play with Matthew Broderick got a bad review, so we savored dinner even more. Here are several journal pages to finish posting from April. The first is from a Gauguin drawing that was a study for his Dancing Girls of Breton. The Morgan Library and Museum had the 5th installment of the Thaw collection drawings and I loved this one! 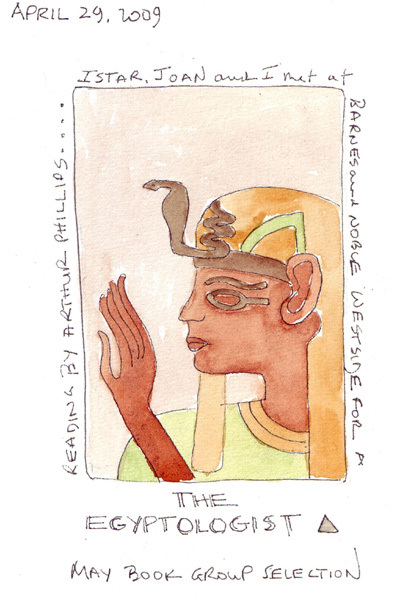 The second is from a reading at Barnes Noble by Arthur Phillips - author of the Egyptologist. My book group is reading it this month. He read from his new novel, but it was still fun meeting him. This image is from the book cover - the colors are mine. I'm not a game player, but have a basket of cards from my children's childhood, occasional games of solitaire, and "War" with my grandchildren. 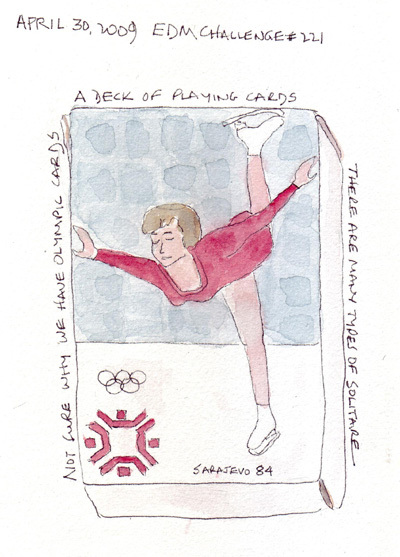 This set of cards has a figure skater from the 1984 Olympics, so at least drawing it game me practice with unusual persepctive with the skater body.